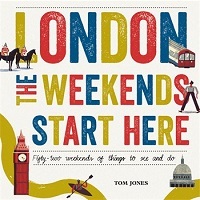 London, The Weekends Start Here: Fifty-two Weekends of Things to See and Do is the third book by Tom Jones. His two previous best-selling books, Tired of London, Tired of Life and Mad Dogs and Englishmen were inspired by his popular website entitled Tired of London, Tired of Life. As the author points out, it is often at the weekend that the city really comes alive and to make the most of our free time, the book offers a wide range of cultural, artistic, historical and outdoor experiences. London, The Weekends Start Here offers 52 themed weekends, organised by season, with over 250 interesting entries for unusual and surprising attractions. Many of the themed weekends celebrate London’s position as a global city which attracts residents and visitors from all over the world. Therefore you can explore American London, Japanese London, French London, Russian and East European London, Immigrant London, Italian London, Nordic London and discover the many contributions these groups have made and continue to make to the London story. If these particular groups are associated with London, so are individuals such as William Morris, Charles Dickens and John Betjeman who merit a section on their own. You can discover different aspects of London History by following the guides on Wartime London, Pirates’ London, Revolutionary London, Political London and Ancient London. The book takes you away from the usual tourist spots of London by providing guides to the Countryside of Croydon, The Back Roads of Bexley and Bromley, Along the River Lea and the Highlights of Hackney. London is famous for its cultural attractions and on your themed weekends you can discover Artistic London, Poets’ London, Musical London and Scientific London. One of the attractions of the book is that each themed weekend offers a great deal of variety, if you explore Scientific London, suggestions include a visit to the Science Museum, Attend a lecture at the Royal Society, See the Broad Street Pump, Drink at the Devereux, Visit the Home of Time, Climb an Experimental Lighthouse and explore the Wellcome Collection. There are over 250 interesting entries which offers a short description of the attraction with information about location and transport. Also dotted throughout the book are a number of weekend tips including suggestions of the best places to eat and drink. Many books about London offer a large array of attractions to visit, however the main attraction of London, The Weekends Start Here is that it applies a certain amount of logic to the enterprise. Rather than keeping you to a particular location, different themes can take you all over London following a particular interest. Alternatively if you do not wish to follow a particular theme, the book offers over 250 intriguing places to visit within the confines of the capital. This well designed and informative book really does have something for everyone, whether you are a Londoner or a visitor. The weekend is a great time to explore London’s large number of attractions and even the most ardent lovers of London will find that the author has provided a number of unusual and relatively unknown attractions to explore. By londonvisitors2014 in London Book Review - Non Fiction on March 31, 2015 .